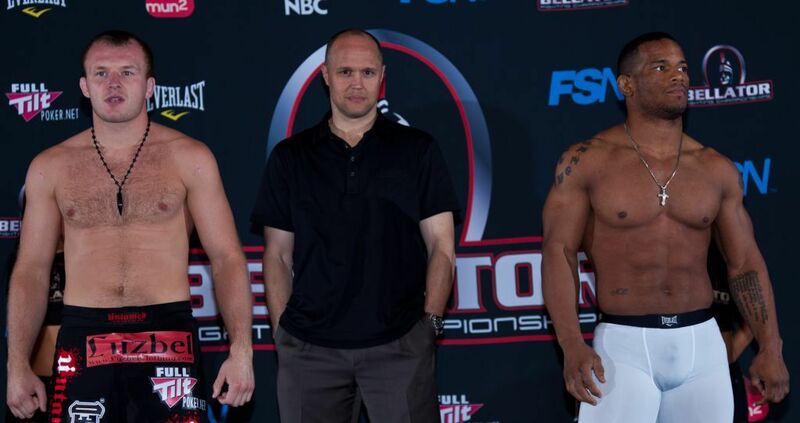 Here are the official weigh-in results for Bellator 34, which will be broadcast live on Fox Sports Net. Hector Lombard (183.25 lbs.) vs. Alexander Shlemenko (184.75 lbs.) @ 185 lbs. Megumi Fujii (113.5 lbs.) vs. Zoila Frausto (114.5 lbs.) @ 115 lbs. Mike Bernhard (185.75 lbs.) vs. Dragan Tesanovic (185.5 lbs.) @ 185 lbs. William Kuhn (170 lbs.) vs. John Kelly ( 172.2 lbs.) @ 170 lbs. Ralph Acosta (135 lbs.) vs. Tulio Quintanila (135.5 lbs.) @ 135 lbs. Frank Carrillo (184.1 lbs.) vs. Moyses Gabin (184.25 lbs.) @ 185 lbs. Igor Almeida (184.5 lbs.) vs. Dan Cramer (185.5 lbs.) @ 185 lbs. Boumny Somchay (161 lbs.) vs. J.P. Reese (159.25 lbs.) @ 160 lbs.